I love the deep rich color of the pasta from the wine! I bet it tastes great with the walnuts! 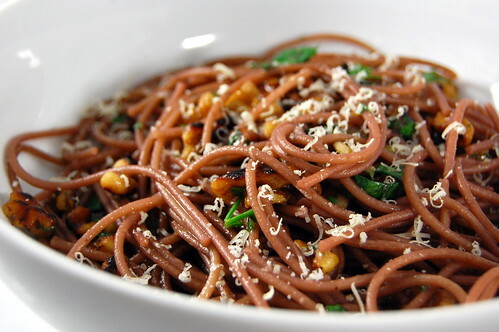 Love that the wine gave the noodles such a pretty hue! I've been wanting to try this, it looks so good and definitely elegant. Hi! This looks and sounds delicious! I plan to make it sometime soon. I am just wondering, did boiling the wine in your pan stain it? Looks great! Did you use dried pasta for this, or fresh? I used dried, but fresh would be fine too. Obviously you'd just adjust the cooking time accordingly. I am just curious- how is it adapted when it is the exact same recipe that is on foodandwine.com?